So if you haven't guessed from my lack of blogging over the month, April has been hard bloody work. It started with my exam on the 4th. The culmination of 6 months of work and 8 weeks of coursework, revision, sitting inside and moaning about revising while it's gorgeous outside, stress and tears. Fortunately the exam wasn't too bad, 3 hours flew by, and despite some hand cramp and a trip to the bathroom, I survived with a pack of fruit pastilles. But then a few days later, just when my stress levels were returning from unbelievably high to just normally high, we got some bad news. I'll spare you the boring details (because god I'm tired of going over it again and again) but after 6 months, our house sale fell through. We're absolutely fine now, but at the time, after 6 months of stress and forms and money and planning, to find out the house we thought was the one wasn't meant to be was heartbreaking. But the good news is, a week or so later, we went to some viewings, and we've had an offer accepted on another house! It's early days and I don't want to get too excited in case we find ourselves in the same position again, but it's a bit bigger and doesn't need all the work the last house did, so hopefully this time it will be a little smoother. So all of this combined has meant the last thing I've wanted to do was blog. I didn't want to talk about the house, but I also felt like I couldn't not talk about the house, or houses, or lack thereof. Things are calming down and moving forward so hopefully I can get back into the swing of things now at least! We've just come back from a wonderfully refreshing weekend in the Lake District, but I already have so much to write about April I think I'll leave that to my May post! So other than all that, what else has been going in April? Obviously I started the month with my marketing exam which was... okay, I think?! To be honest I've barely thought about it since 30 minutes after leaving the room. Considering it was my first exam in 5 years and it was 3 hours long, it was nowhere near as bad as I expected and it being over was a huge relief! With a half marathon around the corner (less than 4 weeks to go!) I've managed a new parkrun PB which I'm really chuffed about - our local course is tough! This weekend will be my 93rd parkrun and my 10th in a row! You know what I love? BANK HOLIDAYS. How good are Bank Holidays?! Easter fell just as everything was hitting the fan with our house but we managed to get some relaxation in, thanks to 13 Reasons Why which gave me the excuse I needed to take a few hours away from doing productive things and actually have a break. I didn't get dressed until lunchtime on Good Friday! Friday we had a lovely chilled day, I bought two pairs of trousers in H&M for £10 each, and we spent the evening at my best friend Eve's playing games. Saturday we went to a house viewing and then I met up with two of my uni friends in Birmingham, Sunday was quiet and chocolate-filled (I gave up chocolate for Lent so it was so good to eat Mini Eggs!) and on Monday we went to the Aquarium and to see Phil's grandparents (more on that later!). My trip to Birmingham was lovely, if shorter than planned! We'd seen a house we loved and Phil insisted that we went to see it, but the only viewing we could get was 1.30pm. It was the first house we'd seen online since our house fell through that we were actually excited about, so we didn't want to miss out on the opportunity. So we saw the house (we did put an offer in, but later realised it wasn't the one), and then I rushed to Birmingham to see my friends for a few hours! It was lovely although brief to see two of my favourite people. The following day we went to Blue Planet Aquarium which was great fun! Okay, we were pretty much the only adults there who didn't have a child with us, but we had a really great time and went through the tunnel where the sharks swim over you TWICE. Then we went to visit Phil's grandparents which was absolutely lovely - it was such a lovely, fun day. 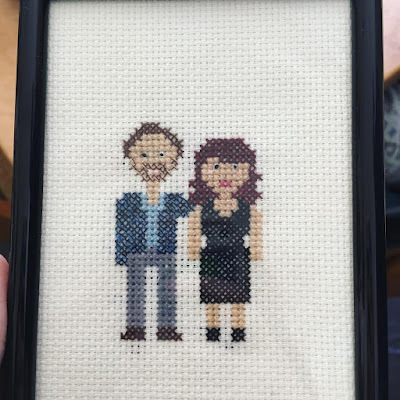 Remember last month when I mentioned I was obsessed with The Guilty Feminist podcast? Well this month I went to see it recorded live! I went with my best friend, Eve, and we had an amazingly fun, girly night. The podcast was hilarious and it was surreal to be there in the audience while it was recorded - I love the podcast even more now! I can't wait to hear our episodes! Amy is one of those people who I just think is incredible and utterly badass, so when she recommended the Moodnotes app, I did a bit of reading into it and was intrigued. Amy has mental health challenges too, and she really recommended this app for trying to keep track of your mood and feelings. I was reluctant to download it as it was £4 but I thought I'd give it a go, and I really like it. I record my mood in the mornings and in the evenings, and at the moment my anxiety has been fairly low level but I like knowing it will be there for challenging times. In a bizarre coincidence, one of my Birthday presents from work was the exact MAC lipstick I'd actually asked my Auntie for for my Birthday! I managed to get it swapped and I'm now the proud owner of All Fired Up lipstick, which is a lovely corally-red - perfect for Summer! After receiving my Fitbit for my Birthday, I've become one of those annoying Fitbit-obsessed people who paces around the living room at 10 to the hour because I haven't hit my hourly step goal. I don't even care - I love it! I'm planning a separate post on my Fitbit - or more likely, stupid things I do now I have a Fitbit! You know what I realised this month? Yoga makes me feel amazing. Yep, I know, not revolutionary at all. Billions of people know that right? But I've kind of being going through the motions with yoga lately and practising one a week as part of my half marathon training, but I've realised it actually makes me feel great and I want to do it more often. It's on my goals for May to do more yoga, and all with Yoga with Adriene, of course! Are you ready to see the best Birthday present ever? Are you? 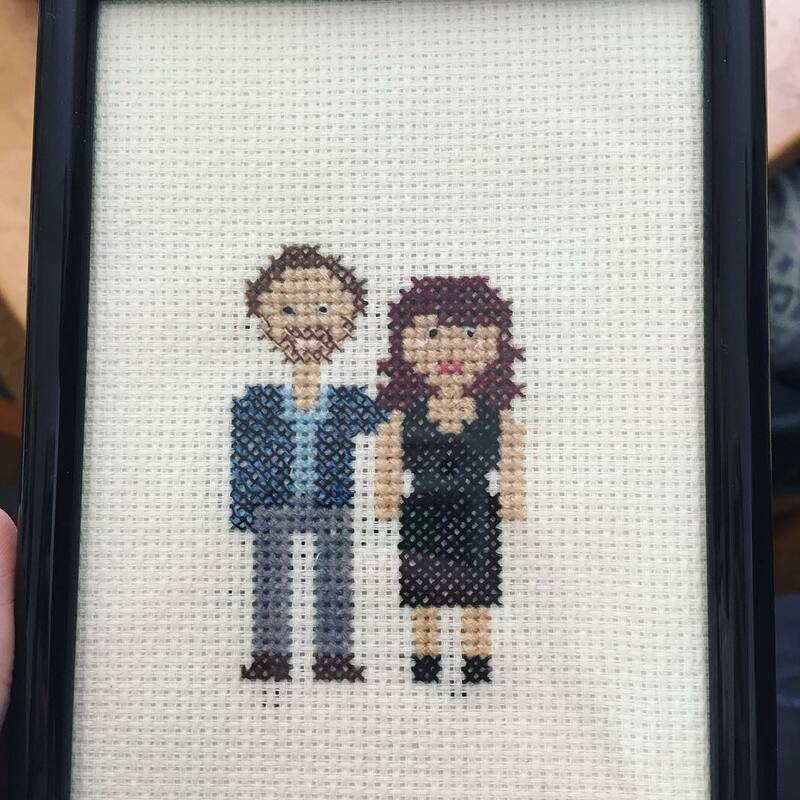 PHIL'S SISTER CROSS-STITCHED US OH MY GOD IT'S AMAZING JUST LOOK AT IT. I got lots of recipe books for my Birthday this year, plus I might have bought a couple of other books last month (I assure you, I'm on a recipe-book-buying ban for the foreseeable future) so I've been working my way through 15 Minute Vegan, Vegetarian Tagines and Cous Cous and Prashad at Home. I've already cooked lots of brilliant recipes from Flavour, and this month I tackled the lemon and black pepper cake and the sweet potato, kale and mozzerella pie. I've never really made a pie before (I didn't make my own pastry...) and this took about 2 hours but it was wonderful and I'll definitely make it again. A few weeks ago when I was all house-sad and ill and grumpy, my friend Kris tagged me in a competition Thaikhun were hosting to win a free takeaway to cheer me up and I won! Because we don't live in town anymore Phil picked it up after work one night and we warmed it up when he got back! I had massaman curry with tofu and it was incredible. Despite living 200m away for 2 years (no, seriously), I finally made it to Samsi a few weeks ago for amazing sushi and gyoza and lovely company with my friend Riven. I can't believe I hadn't been before! Highly recommend. Shout out to my colleague, Molly, and these amazing Birthday cupcakes she made for me! Aren't they amazing? If you're in the Manchester area and want a cake made, make sure you check out her Instagram - Mollol Creations! I got a bit excited reserving books at the library this month and ended up with three books becoming available at once, which is a lot for me! This month I read The Lottery and Other Stories by Shirley Jackson which I absolutely adored. Every story was brilliant - I highly recommend! I also read A Long Way to a Small Angry Planet, a book that I would never have normally chosen, as sci fi really isn't my cup of tea, but I really enjoyed it, and it was good to push myself to read something out of my comfort zone. Finally, I read the sequel to Mr Mercedes, Finders Keepers, which I think I actually enjoyed more than the prequel. As I mentioned before, we joined the club and watched 13 Reasons Why, which I simultaneously thought was brilliant but also felt quite conflicted by. It's one of those things I think I need some time to process to decide how I feel, and I've been finding the discourse around it very interesting. I hope they don't make a second series though - I don't think questions always need answering. We also started Bates Motel last week as Phil is indulging in his love of Hitchcock at the moment (he's out tonight at a 4 week film course on Hitchcock). We've only watched one so far but I'm intrigued to keep going! The Pool - Is fitness fashion creating a barrier to getting exercise? My goals for May are to do more yoga, paint my nails more often, read every day, read more inspiring material and practice my self esteem exercises from my phobia book twice a day. And here's hoping I get back to some regular programming over here this month!